(a) Clean the vehicle body surface. (1) Using a heat light, heat the vehicle body surface. (2) Wipe off any tape adhesive residue with cleaner. 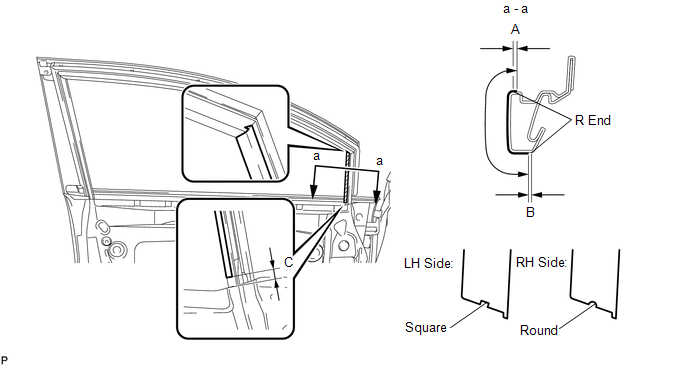 (1) When the ambient temperature is below 15°C (59°F), perform the installation procedure after warming the vehicle body surface (installation surface of the door frame) and tape up to between 20 and 30°C (68 and 86°F) using a heat light. When the ambient temperature is above 35°C (95°F), cool the vehicle body surface (installation surface of the door frame) and tape down to between 20 and 30°C (68 and 86°F) prior to installation. The most appropriate temperature for installing the tape is 25°C (77°F). When the temperature is low, the tape turns stiff and comes off easily. When the temperature is high, the tape looses elasticity. (1) Remove any coating roughness or dirt on and around the vehicle body surface where the tape will be installed (installation surface of the door frame). If any roughness or dirt remains when pressing the tape onto the surface, air will be trapped under the tape and result in a poor appearance. Spray water on the shop floor to settle any dust. (1) The tape bends and rolls up easily. Store the tape between flat pieces of cardboard or other similar objects and keep it dry and level. Do not bend the tape or leave it in high temperature places. Position the tape accurately to achieve a neat finish and to avoid peeling. The tape cannot be reused because it deforms and will not fit any more after being removed. 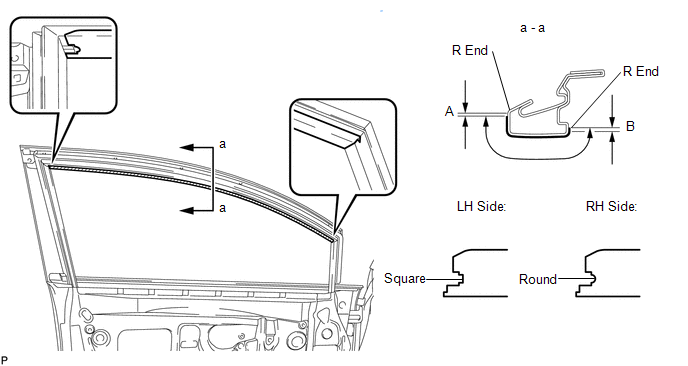 (1) To avoid air bubbles, slightly raise the part of the tape that is going to be applied so that its adhesive surface does not touch the vehicle body while applying the tape. Tilt the squeegee at 40 to 50° (pressing forward) or 30 to 45° (pulling) to the vehicle body surface and press the tape onto the vehicle body surface with a force of 20 to 30 N (2 to 3 kgf) at a constant slow speed of 3 to 7 cm (1.18 to 2.76 in.) per second. Be sure to observe the specified pressing speed, force, and angle of the squeegee to avoid wrinkles or air bubbles. Either angle of the squeegee (pressing forward or pulling) is acceptable. 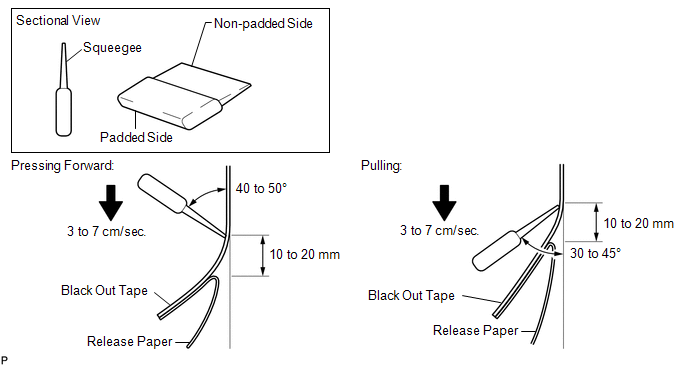 Be sure to apply the tape while removing the release paper 10 to 20 mm (0.394 to 0.787 in.) from the edge of the squeegee. 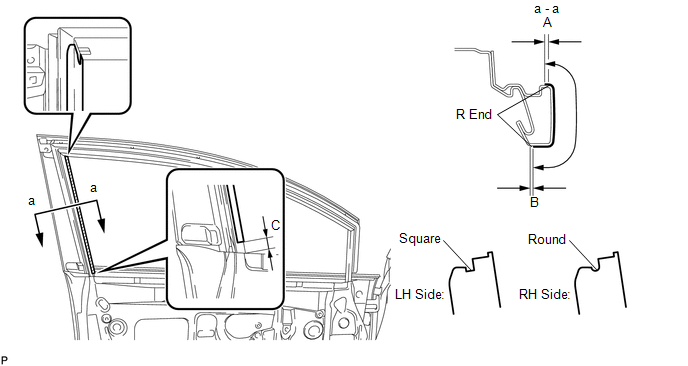 (1) If it is difficult to apply the tape, install it in several steps as shown in the illustration. Use your fingers or the padded surface of a squeegee to slowly apply the tape to the hem of the vehicle, especially for a small hem. When applying tape to the backside of a hem, remove the release paper and use your fingers or the padded surface of a squeegee. (1) Remove the release paper and apply the tape carefully with your fingers. (2) Before applying the tape to each corner, heat the tape using a heat light and gradually apply it, avoiding wrinkles on the tape to achieve a neat finish. (1) After completing the application, check if the tape is applied neatly. If the tape is not applied neatly, reapply using new tape. Do not reuse the tape. 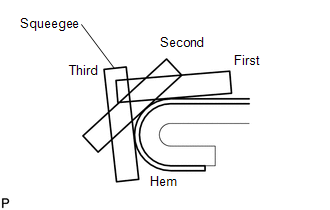 (a) Refer to the illustration to position the No. 1 black out tape. (b) Remove the release paper and apply the tape. (a) Refer to the illustration to position the front door lower outside stripe. (b) Remove the release paper and apply the stripe. (a) Refer to the illustration to position the front door stripe.